Skrill, formerly known as Moneybookers, is an international payment processing service that allows merchants to sell and receive payments online as well as users to receive and transfer money. It is one of the most widely used online payment processors online. Skrill has progressively made digital payments simple, quick and secure since their establishment in 2001. They have been recognized globally for their payment solutions for business people and for pleasure where deposits and withdrawals are made for gaming sites. Skrill prides in offering their services to businesses across the globe and assisting these businesses worldwide and help grow their global customer base and propel growth. The company has its headquarters based in London and their offices are spread across Europe and in the USA. They boast of more than 500 employees who represent over 30 nationalities. They buy Ukash to grow their scale which further enhances their position in Europe’s prepaid online marketplace. Skrill is trusted by millions for every kind of online global payments. They currently make their payments secure, simple and quick. They are in more than 200 countries and support in excess of 40 currencies. Skrill (Moneybookers) is a recognized online payment provider and regulated by the FCA. All payments are made using safe servers and state of the art encryption. Being in this business for over 13 years, Skrill has shown maximum efforts to keep their customer’s money and data safe at all times. Over 36 million account holders already trust Skrill to send and receive money worldwide in 200 countries and 40 currencies, securely and at low costs, without revealing any personal financial details. As a VIP client, you can even use an RSA Token to log in as an additional layer of security for your account. Your information is not shared with retailers. All that’s needed is your email address and password. Your banking information is never revealed. This information is encrypted in the highest standards of the Payment Card Industry Data Security Standards (PCI-DSS Level 1). This means that your information cannot be read even after someone tries to hack it. From Skrill’s security page, you will be able to learn of the different ways fraudsters will try to target you. There are many phishing emails that might be sent to you. Be keen not to share your email address and password since Skrill will never need this information from you. Skrill understands that security is of priority to you. Google Authenticator offers an extra layer of security and is available to Skrill users as well to keep your money safe. This two-factor authentication needs you to enter a code from your phone along with your email and password. Do I have other benefits? You can shop online using your account. You may also order a MasterCard which will be connected to your online account and can be used to pay on and offline. You can also withdraw your money at all ATMs accepting MasterCard. 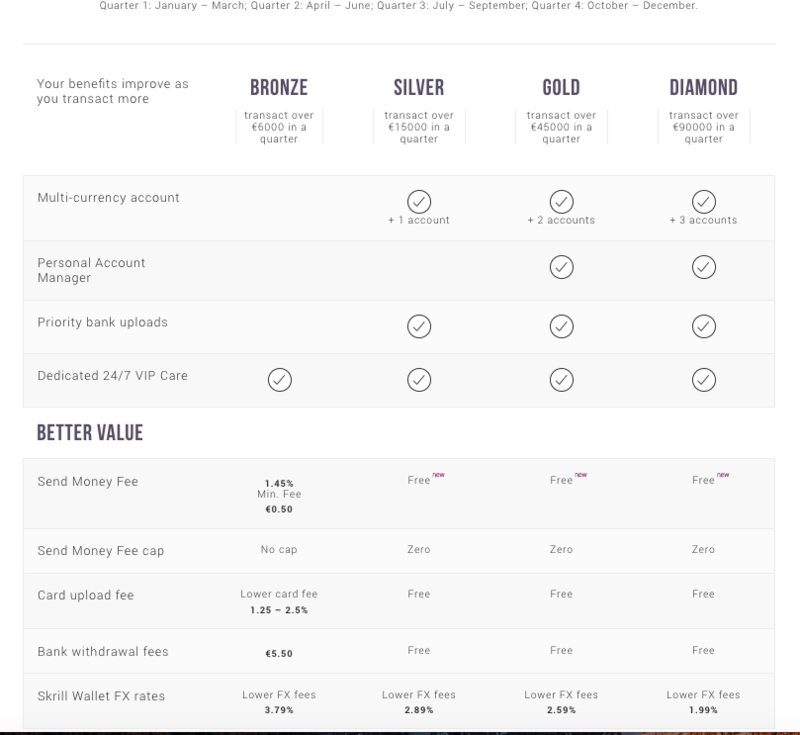 As a Skrill user, you have the ability to become a VIP giving you higher withdrawal limits, lower fees, the MasterCard for free and even cashback on all your transactions. Skrill gives you an opportunity to get VIP treatment. This VIP programme comes with more benefits and one of them is performing your transaction at lower fees, 24/7 support and access to special promotions and additional security services. With the program, you will be joining an exclusive club where you have higher limits to your account both online and offline. You get ultimate protection where you can get as much as 100% money back guarantee for complete fraud protection. 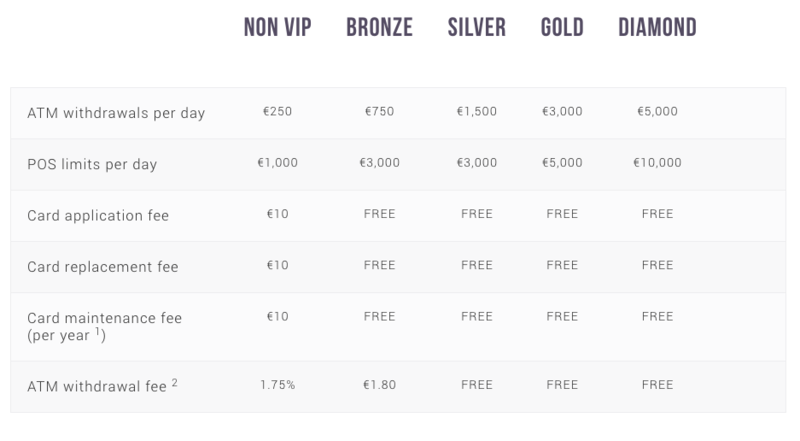 There are three levels of the VIP programme. There are the Bronze, Silver, Gold, and Diamond levels. In this review, we will only mention the amount you get to transact in each level. 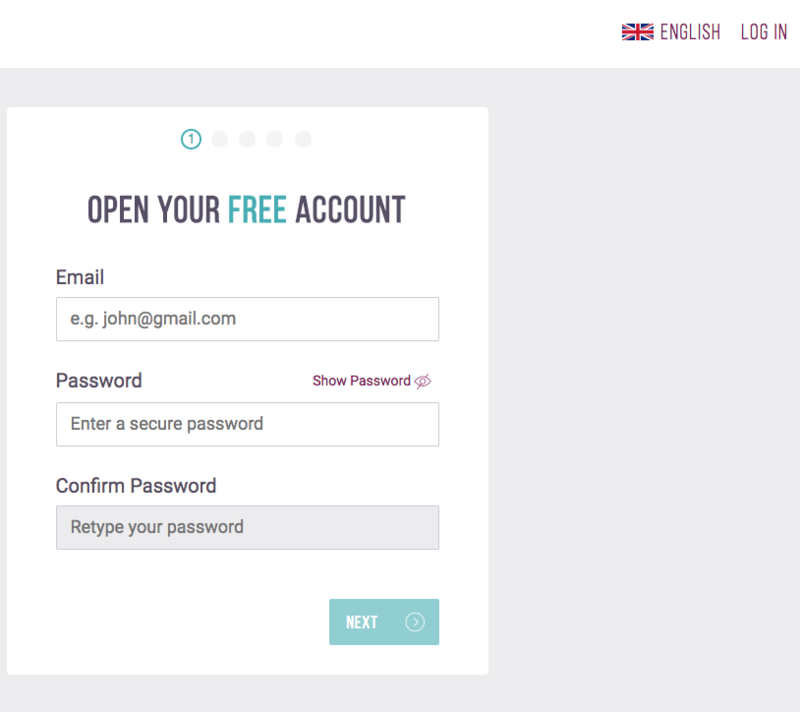 Click on Create a Skrill Account Button and you will be redirected to Skrill’s main page. Now you are on the main page of Skrill and you need to go to Register on the top right. It opens a form in which you should enter your personal information truthfully. Once you’ve done that, your account is ready and ready. As the last step, you’ll need to verify your Skrill account by going to Verify Account and sending a copy of your ID card/passport and a current proof of address to Skrill. The whole process is very simple and every step is explained in your account. You can use your account before verification, but only up to a certain limit, so you should complete verification as soon as possible to increase your account limits. Now you have done all and you can quickly and everywhere deposit and withdrawal money and have through your Prepaid MasterCard always and everywhere access to your money. The MasterCard is a stamped plastic card that you can order once your Skrill account has been successfully verified. With this card, you always have immediate access to your balance and can withdraw money at almost every ATM in the world. Of course, you can also pay with the card in all shops and online shops where MasterCard is accepted. Since the card is highly embossed, it looks like a real credit card and you can also rent a car without any problems. But it is just a prepaid card, you can use of course only the amount that is available on your account. Should you withdraw money from any ATM in the world, you will incur a fee of 1.75%, whether it be Germany, Spain or anywhere else in the world. VIP customer even drops the 1.75%. The use of the card in stores or any online stores is basically free as long as it is the same currency that corresponds to your Skrill account. If you pay in a currency other than your account, up to 3.79% change fees will apply depending on your VIP status. For more information regarding the limits, you can see the following table. Please keep in mind that they are standard fees for normal Skrill Costumer. If you create your account through YourPokerDream, you’ll get much higher limits. Signing up through YourPokerDream make sense! The VIP program is really fantastic because as VIP almost all fees drop off. To reach a VIP status you have to reach a certain turnover volume. This refers to deposits to certain merchants, like poker, casino and sports betting providers. Since you as a customer do not incur any fees for a deposit and withdrawal from a provider, it is advisable to make different deposits and cashouts, in order to enjoy a better VIP status and the associated benefits. Some players even earn money just by making different deposit and withdrawals at the different online operators.